a throw blanket for our bedroom when I came across an abstract cream with pale grey and pale dusty rose fabric. 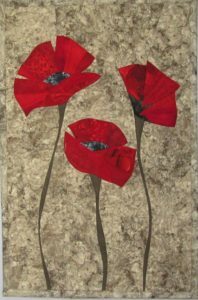 One of my poppy designs is created on an abstract cream/grey/brown background fabric by Stonehenge which I don’t think is being made anymore. Actually I used a more subtle Stonehenge in these colors two years ago and that one seems to definitely be gone. I have felt “OK” about the second Stonehenge fabric but not excited. 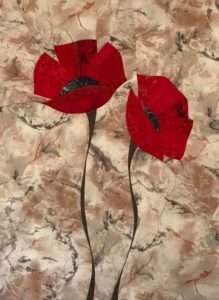 The first picture here is the red poppies on the second Stonehenge fabric….looks good but I’m always on the lookout for a second background for some variety and options for buyers. WELL…I came home with my pillow fabrics and immediately saw how awesome it would look with red poppies pieced onto it. The second picture is of a red poppy quilt on the new background. This quilt is only pieced and not yet quilted or bound on the edges. Some of these cream/pastel fabrics are hard t o photograph to get the full effect which can only be truly appreciated in person. I’m working on a pair of red poppy quilts which can hang together or separately on this new background fabric. After piecing one new quilt, I went back to my local fabric store and bought the whole bolt!! She who hesitates doesn’t get the fabric and I didn’t want to take any chances. As it is I have enough fabric now for about 7 more of these quilts so someone else had already found this fabric which just appeared on the shelf last week. One of the most fun “jobs” in my creation of art quilts is the unrestricted permission I give myself to buy fabric. This one was a total bonus find! !